One of my most favorite essential oils is lemon. It’s so versatile. Because it tastes so fresh, it helps me get my daily recommended quota of water everyday. I don’t know about you, but there are days I just struggle to swallow 64 oz of the stuff. It can be outright bland. Lemon, makes my water a treat. And, gosh, if you own one of those Soda Stream machines, you’ve got yourselves an amazing substitute for all that sugary soda we drink. When I want to get a little fancy, I will add a drop or two of lime essential oil as well. I don’t miss the sugar, and I stay hydrated. I keep a small bottle of lemon in my purse, so whenever I’m out at a restaurant, I just add a drop of lemon oil, especially in places where the water doesn’t taste so good. While less exotic as some essential oils, this one does have its perks. Besides its taste, lemon oil, and most other citrus oils, are invigorating. Lemon is known for its d-limonene content, 68%. Used daily, it can help dissolve gallstones, relieve heartburn and reflux, and counteract against different types of cancer (Sun, 2007). Lemon is a commonly used flavoring in food and juices. I add the essential oil to my freshly baked fish, baked goods, in salads, and my morning smoothie knowing I’m getting the added benefits of d-limonene. Many people question whether this oil will have an adverse effect on sensitive teeth. The answer is simple. The oil is much different from the juice. It’s pH neutral. Lemon juice is acidic at about 2.3 pH which equals about 5% acidity. The oil, on the other hand is made strictly from the rind and skin. 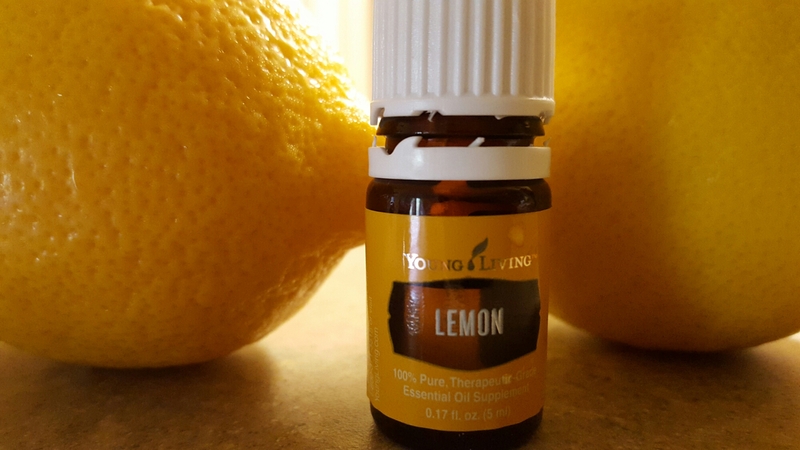 75 lemons are distilled to make one 15ml bottle of Young Living Essential Lemon oil. The result is a highly concentrated oil and safe for consumption. If you’re ready to ditch the chemicals for a toxic free home, lemon oil can help. You’ve probably already noticed that the commercial products for polishing furniture use the scent of lemon. The synthetic oil is not the same. Why not make your own? This is exciting – add one or two drops of lemon to a tsp of coconut oil on a soft cloth. Not only will the wood shine, but the house will smell incredibly clean. Don’t forget to diffuse the lemon oil to purify the air too. A 15ml bottle of lemon oil contains 250 drops making this oil economical. Brace yourself. The retail price of YL Lemon oil is less than $15.00. It’s included in the Premium Starter kit as well. Once you purchase the kit, your cost will be lower since members receive 24% off all products. Think about the money saved here. You are sure to find so many uses for Lemon oil. It’s also a main ingredient in the immune building oil, Thieves. Another great advantage to diffusing Lemon is its uplifting effects and as an aid in concentration. So much better than caffeine, I am more alert when working from home or while I’m at the office. Even if you’re not close to a place to plug in a diffuser, just rub a drop into the palms of your hands and cup them over your nose while inhaling deeply for the same effect. Wow. I don’t want to forget to mention that while it seems that detoxing is the latest craze in weight loss, the lemon oil does help flush the system effectively and aids with normalizing digestion. That’s really what detoxing means. The goal is to help your body do its job – eliminate the harmful toxins that are ingested each day. These toxins aren’t just what is consumed by mouth. Toxins are in the air we breathe and the stress we accumulate over time. Removing toxins is just one step toward weight loss and mental clarity. Who wouldn’t want that? Yes, this post has a lot of information, but I hope you’re just as excited about using lemon oil as part of your daily supplemental routine as I am. For information on how to order, use http://www.youngliving.org/cheryl9059.